America has long stood as a beacon of hope and opportunity, and few embody that spirit here at home and beyond our borders more than the members of our Armed Forces. Veterans Day is a time for us to pay our respects to all those who have served. 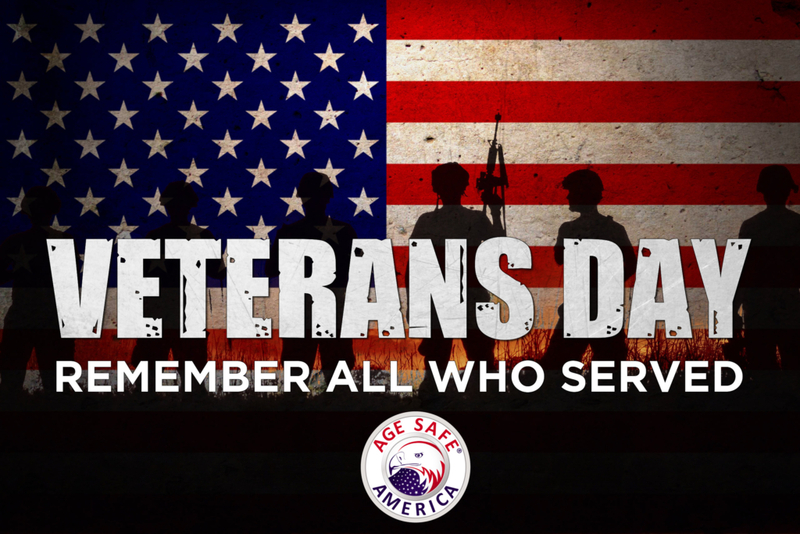 For one day, we stand united in respect for you, our Veterans. Fire Prevention Month (and week) raises awareness about fire safety and home safety to help ensure your home and family are prepared in the case of an emergency. This is a perfect time to discuss fire safety with your family. Every family’s safety plans will differ from the next, that is why it is important to sit down with your whole family and plan your home’s fire safety plans. In 1922, the National Fire Protection Association named the second week in October Fire Prevention Week in commemoration of the Great Chicago Fire in 1871. Today, we celebrate Fire Prevention Week and Month by raising awareness and educating families, students and communities across the United States. Fire departments go around to schools and communities to talk to kids and teach them about fire safety and what to do to keep your home safe and what to do in case of a fire. These facts and statistics are reasons why your home needs to be equipped with the proper amount of fire safety equipment and alarms. Fire Prevention Month is a great time to kick start your families commitment to fire safety! Forgetting to monitor the batteries in your smoke alarm or carbon monoxide alarm is a common error that could have major repercussions. This is why 10-year battery-operated alarms continue to gain popularity. With battery-operated smoke alarms, it is recommended that batteries are replaced every six months. However, with 10-year battery-operated smoke alarms, you can rest assured knowing that 10-year sealed battery offers continuous power for the life of the alarm. Veterans Day is a time for us to pay our respects to all those who have served. For one day, we stand united in respect for you, our Veterans. On the 11th hour of the 11th day of the 11th month of 1918 an armistice between Germany and the Allied nations came into effect. On November 11, 1919, Armistice Day was commemorated for the first time. In 1919, President Wilson proclaimed the day should be “filled with solemn pride in the heroism of those who died in the country’s service and with gratitude for the victory”. There were plans for parades, public meetings and a brief suspension of business activities at 11am. 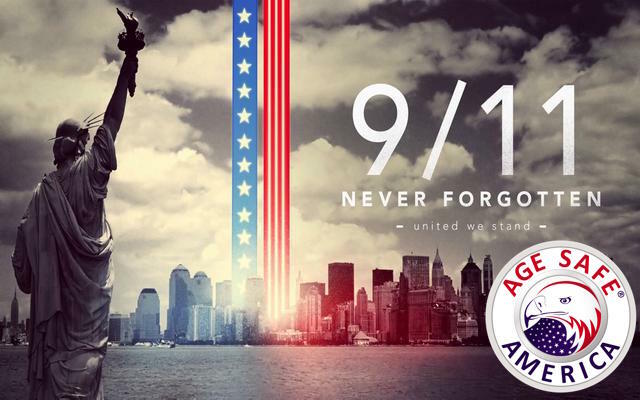 This holiday started as a day to reflect upon the heroism of those who died in our country’s service. However, in 1954, the holiday was changed to “Veterans Day” in order to account for all veterans in all wars. 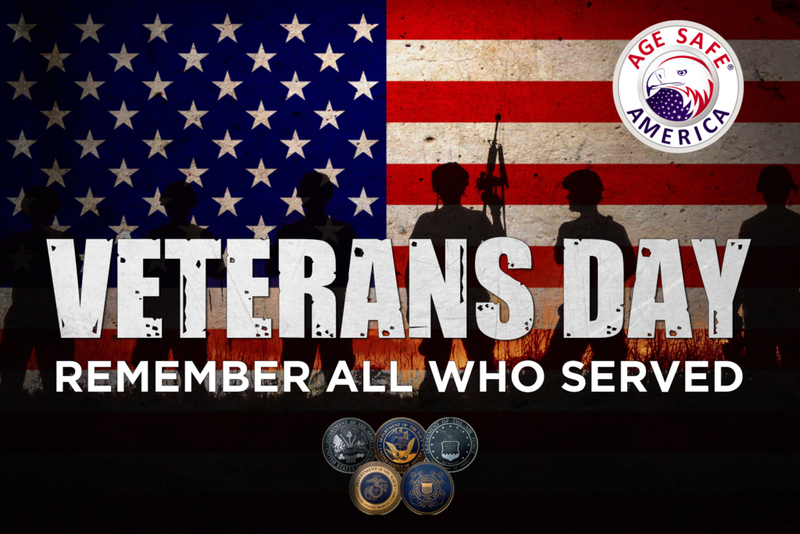 In this 99th year of commemoration, the Department of Veterans Affairs is broadening that tradition of observance and appreciation to include both Veterans and Military Families for the entire month of November. Veterans Day is not to be confused with Memorial Day, a U.S. public holiday in May; Veterans Day celebrates the service of all U.S. military veterans, while Memorial Day honors those who died while in military service. This day is also the 242nd Birthday of the United States Marine Corps. –Semper Fi. Fire is the number one emergency in the United States. The U.S. Fire Administration reports each year, more than 4,000 Americans die in fires, more than 25,000 are injured in fires, and more than 100 firefighters are killed while on duty. Most of these deaths occur in residences and could have been prevented. Older adults face the greatest relative risk of dying in a fire. In a report by the US Fire Administration in 2014 older adults represented 14 percent of the United States population but suffered 38 percent of all fire deaths. Older adults over 65 have 2.6 times greater risk of dying in a fire than the total population. And those ages 85 and over were 4.1 times more likely to die in a fire than the total population. 1) Smoke Alarms – These are a very important addition to your home. Smoke alarms are widely available and inexpensive. 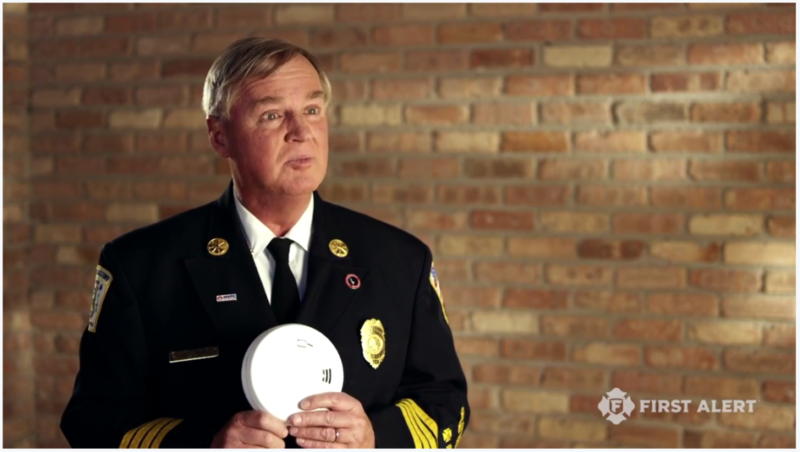 Install a smoke alarm on every level of your home and test it monthly. 2) Prevent Electrical Fires – Don’t overload circuits or extension cords. Cords and wires should never be placed under rugs or in high traffic areas. Avoid loose electrical connections by checking the fit of the plug in the wall outlet. If the plug loosely fits, inspect the outlet right away. A poor connection between the plug and the outlet can cause overheating and can start a fire in minutes. 3) Keep Plugs Safe – Unplug all appliances when not in use. Follow the manufacturer’s safety precautions and use your senses to spot any potential disasters. If a plug is overheating, smells strange, shorts out or sparks – the appliance should be shut off immediately, then replaced or repaired. 4) Alternate Heaters – Make sure there is ample space around any portable heating unit. Anything that could catch fire should be at least three feet away. Inspect your chimney annually and use fire screens to help keep any fires in the fireplace. 5) Fire Safety Sprinklers – When combined with working smoke alarms, home fire sprinklers greatly increase your chance of surviving a fire. Sprinklers are affordable and they can increase property value and lower insurance rates. 6) Create An Escape Route – Create and practice your escape plan with your family from every room in the house. Practice staying low to the floor and checking for hot doors using the back of your hand. It’s just like a routine school fire drill – but in your home. 7) Position Appliances Carefully – Try to keep TV sets, kitchen and other appliances away from windows with curtains. If there is a wiring problem, curtains can spread a fire quickly. Additionally, keeping your appliances away from water sources (like rain coming in from windows) can help prevent wiring damage which can lead to a fire. 8) Clean Dryer Vents – Clothes dryers often start fires in residential areas. Clean the lint filter every time you start a load of clothes to dry or after the drying cycle is complete. Make sure your exhaust duct is made of metal tubing and not plastic or foil. Clean the exhaust duct with a good quality dryer vent brush to prevent blockage & check for lint build up behind the dryer at least twice a year. 9) Be Careful Around the Holidays – If you fill your home with lights during the holiday season, keep them away from anything that can easily catch fire. Check all of your lights prior to stringing them up and dispose of anything with frayed or exposed wires. 10) Conduct Regular Inspections – Check all of your electronic equipment and wiring at least once a month. Taking a little time to do this each month can really pay off. Following these simple tips could potentially save your life or the life of a loved one. 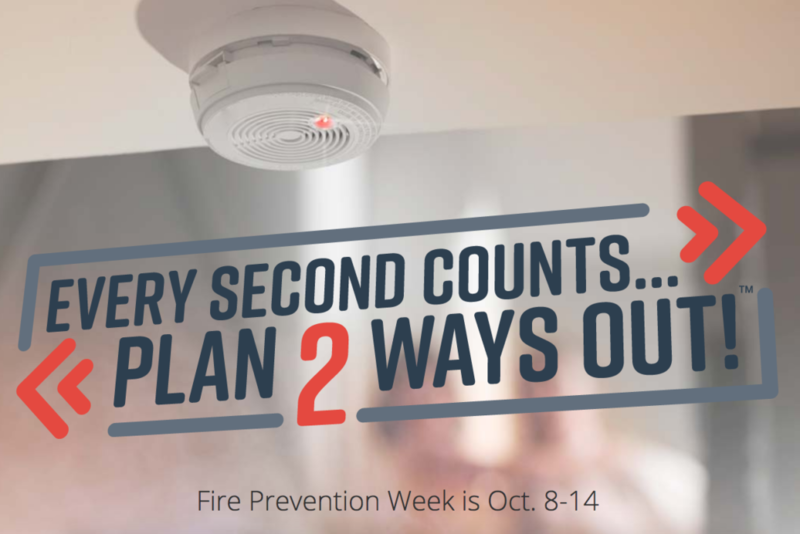 Pass this list on to your friends and family and make this fire prevention month count! Sunday night September 10th at 6PM the power went out. My wife and I had set-up a nice cave in an inner walk-in closet with pillows, water, flashlights, food and phones. From 8-12PM Irma was on the doorstep of Sarasota and the surrounding communities. Around midnight I received a text from a buddy who lives even closer to the coast saying congratulations you just survived your first hurricane. Soon after that we made the decision to retreat back to our own bed, yet I stayed vigilant throughout the night listening to the howling gusts, awaiting the possibility of a window breaking in. Monday morning, the power is still out, yet it is a lovely day with a kind breeze and I am sitting on the patio with my wife beginning to write this article. I hear the freeway roar with weary travelers heading back to Miami and throughout south Florida from wherever they went up north for refuge. Families driving home and wondering what their homes may look like, are their neighborhoods flooded, their fences still up, roof still in tact, and if the power is on? And for those that stayed we were assessing damage and simply trying to get over the surreal event. Shelters were still on lock down as per protocol after such an event to assess for safety. 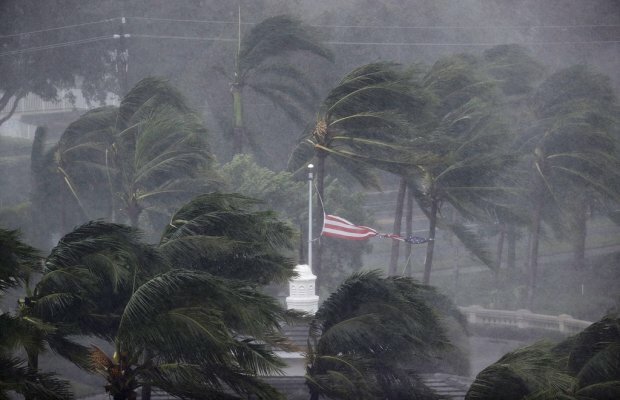 My family and I have been in Florida for 10 years with no real imminent danger from a hurricane. As fate would have it, our first hurricane just happened to be the largest storm ever recorded in the Atlantic, and I had no point of reference. Like many others we were throwing together our “hurricane kit” three days before Irma was to impact our area. Food, water, camp stoves, first aid, flash lights, cash, keys, important documents, tools, propane, etc, etc, etc. My stomach was upset for days, which is unusual and my head was a bit scattered as if dazed and running on autopilot. I even found myself caught up in the herd mentality for a moment. In those final preparations it is easy to get lost in fear and scarcity especially when you are facing a foe you have never seen. No more water, no more plywood for boarding up windows, no more gas, no more generators. Last minute we spent hundreds of dollars on additional food items building our reserves. In lieu of available drinking water we bought Pellegrino and Gatorade. Constantly thinking and mentally preparing for no power or water for days or even weeks. The psychology of boarding up your windows and using a closet as a shelter is a whole other article. So how do you prepare for what was being called the largest storm ever recorded in the Atlantic? First off, as Floridians we live outside year around. Tables, chairs, lounges, sofas, umbrella’s, plants, sculptures and BBQ grills, everything becomes a possible projectile, a menacing object that could be picked up and tossed through a sliding glass door or window. Everything needed to be boarded up, secured or brought inside. We thought of possible flooding in the house and rolled up the nice rugs and put anything of value up on tables. We wondered should we take the art off the walls? Then your monkey mind gets busy. How do I secure the grill when we saw cars turned over by the same storm days before? How will our fence hold up, or for that matter, how will the walls of the home bare the sustained wind force? That brings me to the final decision us and many of our friends and neighbors had to make. Like the song from the Clash, “should I stay or should I go”. Do we grab a last minute flight now 10 X the normal fare? Do we hit the freeway and evacuate voluntarily with a million others all heading up I-75, many of whom were given mandatory evacuation orders? Or do we go to a shelter with people, pets and others’ fear and drama? Our son is part of the Beach Patrol and an EMT and was working a 12-hour shift at one of the shelters, so we had some connection there. I have spent many nights in camp with bears looking for food as I lay in my sleeping bag under the stars, yet for some reason that did not frighten me like this did. Maybe it’s because I have always respected the immense power of Mother Nature. I was telling some friends, “Irma doesn’t know anything about spaghetti models; she will turn at will.” You can’t fight the wind. Although since this is Florida, a Pasco County Sheriff did in fact have to warn residents not to shoot at the hurricane. “DO NOT shoot weapons @ #Irma. You won’t make it turn around & it will have very dangerous side effects,” the office posted on Twitter. We made our decision to stay, or as it was being called, shelter in place. As with any time you struggle with an important decision and finally agree on a course of action, it is somehow calming, liberating and empowering. Family members in other states thought we were nuts, but they already knew that. We were as prepared as we were going to be, so now we wait. And as native Floridian Tom Petty wrote in one of his many hit songs, “the waiting is the hardest part”. I likened the 2 days before Irma hit to grade school when before first period the big bully calls you out for a fight ‘after school’ and now you have to wait the entire day thinking about the impending doom of the a** woopin’ you know is now your fate. Cat·a·stroph·ic (involving or causing sudden great damage or suffering). We seem to hear this word every other day in some obscure place on the globe, but it seems far removed, somewhat insulated from our reality and day-to-day lives. Not in our backyards, not our home, not our neighbors and loved ones. Irma really brought it home for me and millions of others. I now have more understanding and compassion for the pain and suffering of our global family caused by catastrophes that can happen to any one of us, in an instant, on any given Sunday. A couple days prior to the hurricane my new neighbor Rose, a lovely 83 year old gal whom I helped to get ready for the storm, told me some local folklore. As it’s been said, “two or three hundred years ago the wife (or daughter) of an Indian Chief said a blessing that this entire area and burial mounds be kept safe from the devastation of hurricanes”. As fate would have it, we were spared any significant devastation. As we go about getting our homes and our lives back to normal a deep sense of gratitude begins to sink in. Days passed before my guts relaxed and my conscious mind was ready to let go of the fight-or-flight mechanisms accepting the fact that catastrophe was not ours to endure. The fight-or-flight response is a physiological reaction that occurs in response to a perceived harmful event, attack, or threat to survival. The after effects of such are often feelings of agitation and exhaustion which I myself experienced and heard the same from many other friends. I pray for all those whose lives have been violently interrupted with devastation. How do you go on, move forward? No home, no belongings, no job, no income; and very possibly no hope. I guess as humans we somehow just do. The human spirit gives us the capacity to see it through. CC Scott wrote, “The human spirit is stronger than anything that can happen to it”. The issue of resilience comes up when we are faced with extreme situations; situations for which we have had little or no occasion to develop adaptive mechanisms. There is no handbook for coping with a catastrophe. There are however some guidelines, and I would highly recommend anyone reading this article to heed those and get prepared the best you can on the outside, the rest is of course an inside job. This experience has helped me realize in a very personal way what a powerful service our Age Safe America Advisor Members offer to seniors and their family members. Like the older adults they help to ‘age in place’, we chose to ‘shelter in place’, as we did not want to leave our home either. It’s where we feel safe, it is familiar, surrounded by our “stuff” even if the place was a bit in chaos and looked like we were moving, we had our neighbors and friends close. At 58, I am still one of the youngest guys on my block and did what I could to help the older folks in the neighborhood, and if nothing else knocked on the door and let them know we were staying and I would be available if they needed me. Having been in this home only a short while it was the first time meeting many of the neighbors. To do so in such circumstances was actually a good thing, as we were already bonded in preparing for the coming storm, and subsequently the gratitude and clean-up. Thank you to all the First Responders (our son Zak included) throughout the states and the Caribbean. It is good to know there are still Real Heroes out there! Also glad we live in Sarasota County! Even today there are buses with water, phone chargers and air conditioning for those still without power as a place of respite. And a high five to corporations like Starbucks who paid their people for hours they lost during mandatory store closures. A simple gesture, a good message. The catastrophic rampages of Hurricane Harvey and Irma have left many displaced and in need. Organizations are on the ground helping victims. It is never too late for you to donate your time or money. “In a real sense all life is inter-related. All men/women are caught in an inescapable network of mutuality, tied in a single garment of destiny. Whatever affects one directly, affects all indirectly.” -Dr. Martin Luther King Jr.